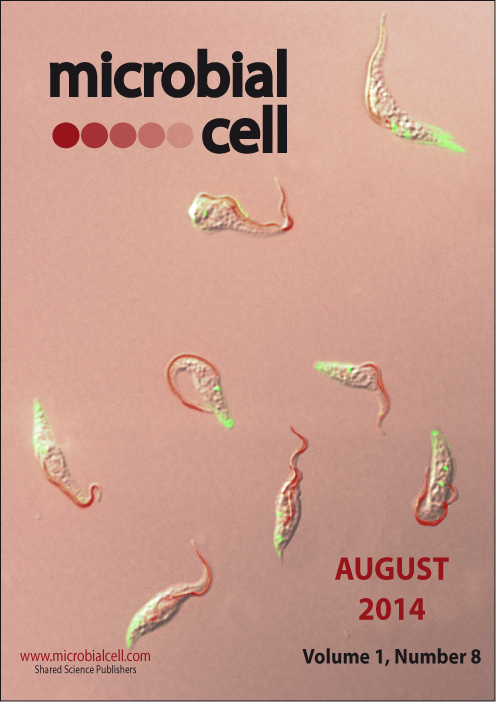 Trypanosomes with motile flagella (red) that are nucleated by the flagellar basal bodies (green) and are attached to the cell body. Nuclei and kinetoplasts, the cell’s unique mitochondrial DNA complex, are shown in blue. Image was acquired using epifluorescence microscopy by Ziyin Li (University of Texas Medical School at Houston, USA). The cover is published under the Creative Commons Attribution (CC BY) license.